Eight kilometres south of Béthune is this little cemetery holding the remains of over 100 war casualties. 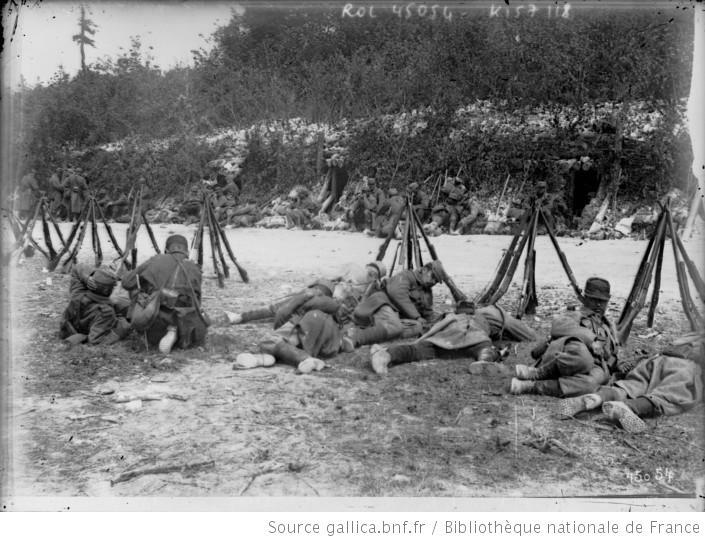 Reservists in bois de Noulette; the ground surrounding the cemetery still shows the violence of ninety years previous. 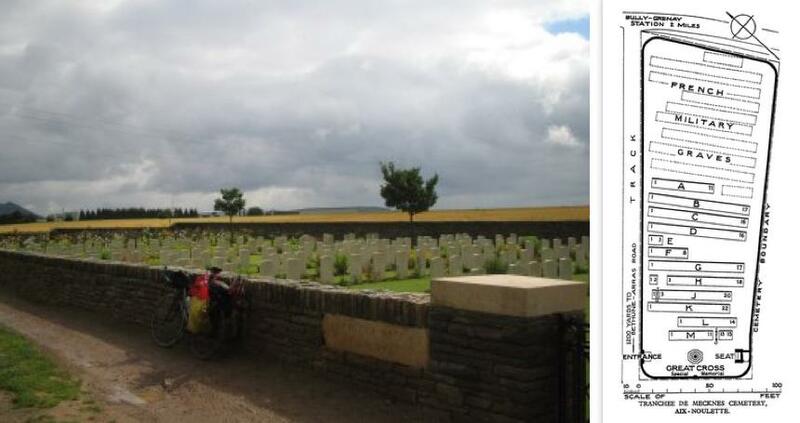 I came across this cemetery started by French troops in May, 1915 outside of Lens on the road from Arras to Béthune. The trench, and consequently the cemetery, were named from the Arab version of the town of Mequinez in Morocco, from which these troops had come. There are nearly 200 graves here. A concrete shelter I came across nearby. 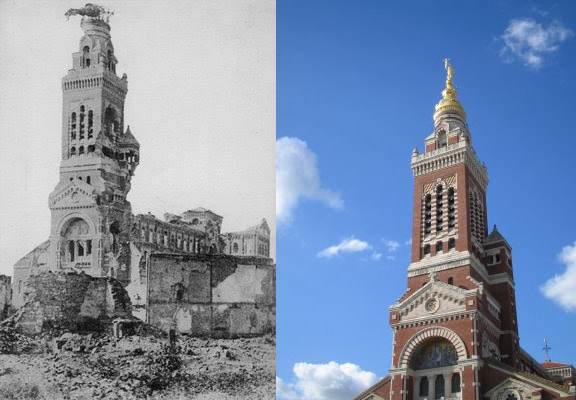 Le Grande Place before and after the war, and today. Béthune was an important British headquarters and suffered extensive German bombardment between 1915 to 1918. L'hôtel de ville then and now. This spire contained a peal of bells, one of which, dated 1576, was called "La Joyeuse" which had given its name to the street behind the belfry, which leads to the Church of St. Waast (1533—1545), whose massive tower was more than an half-century later than the rest of the building. When I arrived in mid-July it flew the Tibetan flag in solidarity with another small peaceful land suffering occupation and military subjugation. Fouquieres-les-Bethune is a village less than a mile south-west of Béthune. This village cemetery has graves from both world wars with 387 Commonwealth burials from the First World War (of whom 249 are from the 46th (North Midland) Division, which spent three years in the neighbourhood and based its transport here) and 29 from the Second with five German war graves. Roclincourt was just within the British lines before the Battles of Arras, 1917; the 51st (Highland) and 34th Divisions advanced from the village on the 9th April, 1917, and the 1st Canadian Division attacked on their left, across the Lens road. Arras Road Cemetery was begun by the 2nd Canadian Infantry Brigade soon after the 9th April, 1917, and until the Armistice it contained only the graves (now at the back of the cemetery) of 71 officers and men of the 7th Canadian Infantry Battalion (British Columbia Regiment) who fell in April, May and June, 1917; but in 1926-29, it was enlarged by the concentration of 993 graves from a wide area mainly North and East of Arras. Ste. Catherine is a village adjacent to Arras on the north-western side. 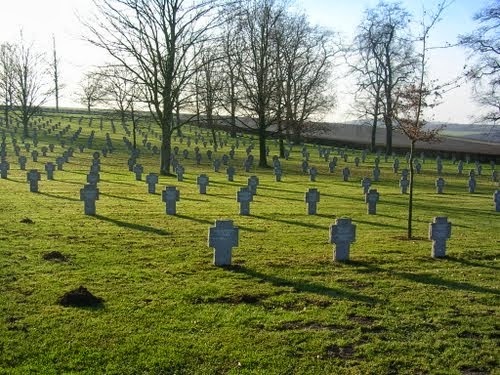 This cemetery of 339 Great War buriels (4 unidentified) is on the left of the road to Therouanne (the D341), not far beyond the Church, then along a side street. Two Yorkshiremen shot at dawn for desertion- Privates T. W. Watts and W. Neave, 10th Bn. West Yorkshire Regiment, executed August 30, 1917. I'm unable to ascertain why both men, a member of the Imperial War Graves Commission and a Frenchman, lie in the same bilingual grave. The cemetery is located on the Bethune Road (D63) from Arras to Lens and has ten airmen's graves dating from the Second World War. Louez-les-Duisans is a hamlet on the north-west edge of Arras taking the N39 Arras to St. Pol road before turning right at the first junction after the Arras ring road intersection and then following the D60 north to the 'Hamen du Louez'. This CWGC is the resting place for 204 Commonwealth soldiers of the Great War joined by two German war graves. This is the largest German Military Cemetery in France with 44,833 burials. 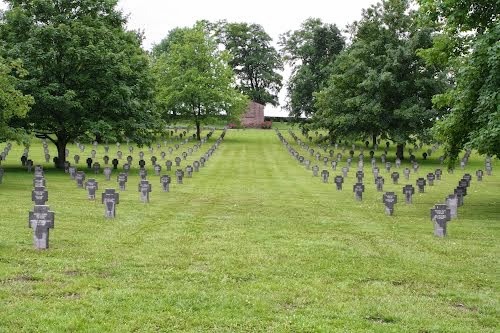 Like most other German cemeteries it is a concentration cemetery. In the early 1970's the old wooden crosses were replaced with new metal ones each engraved with up to four names. 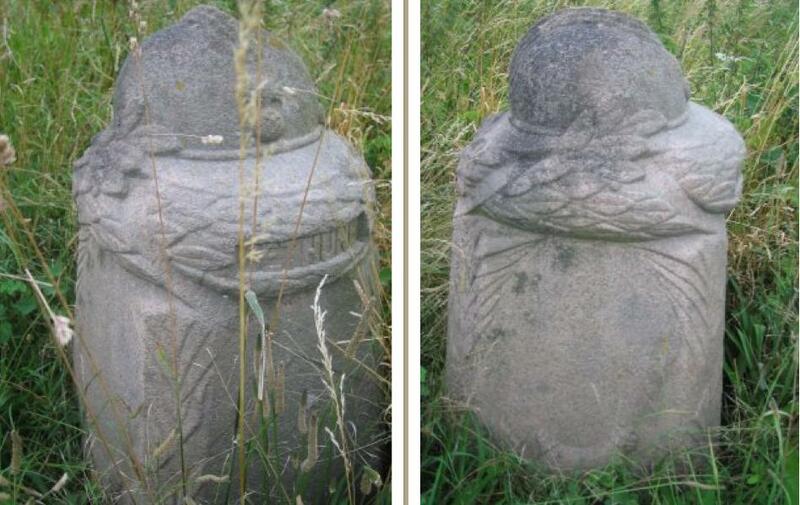 Jewish soldiers received a headstone and 129 of these are scattered about the field. 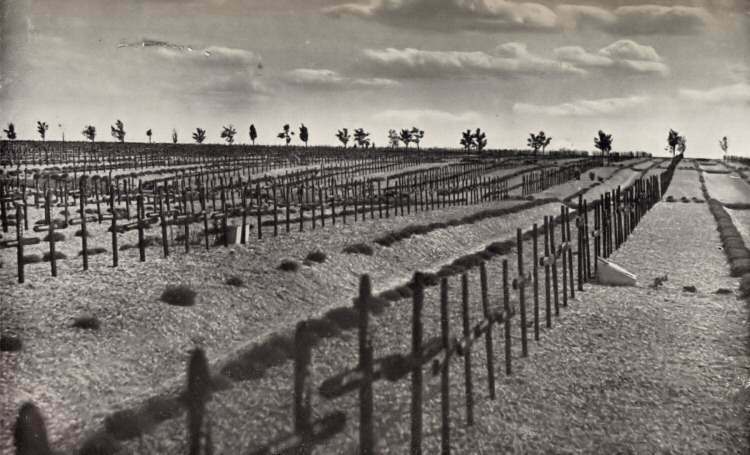 A mass grave 140 metres long is situated along the front wall of the cemetery and holds the remains of 8,040 soldiers. The names of 842 identified bodies are marked on the metal plaques. This cemetery is located in a suburb of Arras. Although families had the option of declining the cross, in this case given the inscription it would appear odd to have been out of atheism. Hard to imagine the Second Battle of Arras raging here. According to Coombs MBE (p.81), Ayette, 15 kilometres south of Arras, was "the scene of fierce fighting by the 31st and 32nd Divisions in March and April 1918." The village was behind the German lines and captured in March 1917. 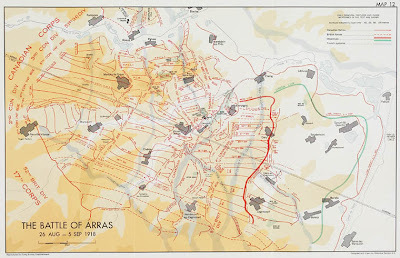 In 1918 during the German offensive it was defended by the 62nd Division. This small plot is the final resting place for 54 soldiers. Three of the graves are represented by special memorials After having been destroyed by shell fire. This farming village is a further three miles south going down the D919 road at the junction with the D8. It lay behind German lines and served as both a base and billeting area until the British were in range with their artillery. It was finally taken in March 1917 and was defended by valiantly by the 62nd Division after the German advance on March 26, 1918. The 68 First World War burials (two of whom are unidentified), all date from 23-28 August 1918. Just south of Bucquoy is this cemetery holding the graves of over 700 soldiers, 527 identified. 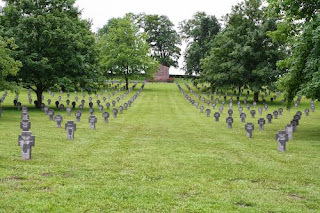 89 are buried in this cemetery just outside the village on the road to Hannescamps. Three kilometres north of Albert are the two hamlets of Becordel and Becourt which were in the British rear lines from which units moved into action. On 30/31 July 1916 at Bazentin-le-Petit, France, the battalion was consolidating its position and Private Miller was ordered to take an important message under heavy shell and rifle fire and to bring back a reply at all costs. He was compelled to cross the open and on leaving the trench was almost immediately mortally wounded. In spite of this he managed to deliver the message and to stagger back with the answer, falling dead at the feet of the officer to whom he delivered it. The grave of 2nd Lt. Henry Webber , 7th Battalion, South Lancashire Regiment, the oldest recorded battle death of the Great War. Apparently he received his commission on 26th July 1915 aged 67 after having lied about his age knocking off 10 years (other sources have him at 68). On the outbreak of war he offered his services to the War Office as a "rough rider" or in any other capacity. Rejected he tried very hard to form a mounted company of hunting men, which was also rejected so he set off to get a commission. Shortly before his 68th birthday he was gazetted on the 1st of May 1916 as a 2nd Lieutenant in the 7th Battalion of the South Lancashire Regiment and after a short period of training at Park Royal was appointed Transport Officer and left for France. "Fifty one years ago I got my colours in the XI and last week 51 years ago was bowling against the old boys and looking on some of them as "sitters" and in the "sere and yellow leaf". Yet here I am a Lieutenant in HM army having to salute three sons if I meet them out here, a Colonel and two Majors. I am 1st Line Transport Officer to this Battalion and we have been plumb in the centre of the picture during the last ten days and gained no end of "kudos" and also a very severe mauling. I am so far extraordinarily fit and well, though, when I tell you that for four consecutive days I was either on my feet or in the saddle for twenty one hours, out of twenty four, you will see that there is a bit of work attached to the job." Four days later, before the letter was received, he was dead. He had taken rations up for his battalion and was talking to his CO at Battalion HQ in Mametz Wood when he was struck by a shell fragment. He was taken to the advanced dressing station, and still unconscious was taken to the nearest Field Hospital where he died on the same evening, the 21st of July. His Commanding Officer wrote "He was so gallant and full of energy. We all had the greatest admiration and respect for him." He was mentioned in Sir Douglas Haig's despatches of the 4th of January 1917. His three serving sons were Lt Col N.W. Webber DSO RE, Maj H.H. Webber RGA and Major LM Webber RFA. He left a widow and eight children. According to Jan Morris in the second book of her imperial trilogy, Fred Selous reached nearly the same age when he "was killed in action in 1917 as a captain in east Africa"at the age of 66. This remarkable individual according to Morris was "a great hunter, who had... killed hundreds of elephants in his time, had won the Founder's Medal of the Royal Geographical Society, liked to travel through the bush wearing nothing but a shirt, a hat and a belt, and claimed to have seen an extraordinary animal called a Nandi bear, like a cross between a hyena, a bear and a leopard." He wrote Sunshine and Storm in Rhodesia before retiring to Worplesdon in Surrey before volunteering for the Great War. (90-91), Pax Britannica. Father and son buried side-by-side- 44 year old Sergeant George Lee and 19 year old Corporal Robert Lee. Both served with 'A' Battery of the 156th Brigade of the Royal Field Artillery, and were killed in action on September 5, 1916 with Frances Lee back in Peckham losing a husband and son on the same day. On 1 July 1916 near Fricourt, France, when Major Loudoun-Shand's company attempted to climb over the parapet to attack the enemy's trenches, they were met by very fierce machine-gun fire which temporarily stopped their progress. The major immediately leapt on the parapet, helped the men over it and encouraged them in every way until he was mortally wounded. 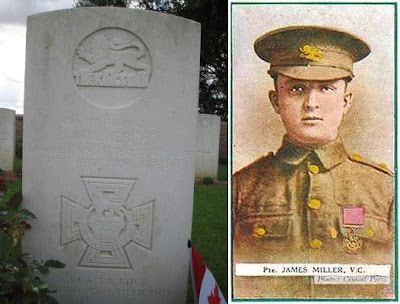 Even then, he insisted on being propped up in the trench and went on encouraging his men until he died. On the other side of the road is this cemetery which contains 862 Great War and 25 Second World War casualties of whom 12 Great War and 8 Second World War casualties are unidentified. Brigadier-General Henry Clifford, DSO died whilst in command of the 149th (Northumberland) Brigade by a German sniper when inspecting trenches near Mametz Wood. He was the son of Major-General Sir Henry Clifford who had won the Victoria Cross when serving as a Lieutenant in the Rifle Brigade in the Crimean War in 1854. Brigadier-General Henry Clifford's nephew, Lieutenant Hugh Clifford was killed on the first day of the Somme, and is buried at Ovillers Military Cemetery. (Temporary Lieutenant- Colonel) R. B. Barker was captain in the 23rd Royal Welsh Fusiliers when he married Gertrude Hobson and joined a battalion of the Royal Fusiliers in 1914 which he commanded in France. He had been mentioned in dispatches four times. It was after organising the defences of a wood after having first making a personal reconnaissance under shell and machine gun fire that he had been awarded the DSO before being promoted to Brigadier General. He was killed in the debacle of 1918. On January 15, 1915 the statue of Mary and the infant Jesus - allegedly found by a shepherd in the Middle Ages and credited with miraculous properties so that by the end of the nineteenth century Albert was christened by Pope Leo XIII 'The Lourdes of the North' - on top of the Basilica of Notre Dame de Brebieres was hit by a shell and left suspended in an horizontal position about to fall. The Germans said that whoever made the statue fall would lose the war, and a number of legends surrounding the "Leaning Virgin" developed among German, French, and British soldiers. The Leaning Virgin became an especially familiar image to the thousands of British soldiers who fought at the Battle of the Somme, many of whom passed through Albert, which was situated three miles from the front lines. The British and French for their part believed that the war would end of the day that the tower came crashing down and so both sides took care not to aim shells at the tower holding the statue. This arrangement suited the allies since the tower provided a valuable vantage point from which to view the opposing German forces. When the German army recaptured the town in March 1918 during the Spring Offensive the British bombarded the basilica to prevent it from being used by the Germans as an observation post. The statue fell in April 1918 and was never recovered. In August 1918 the Germans were again forced to retreat, and the British reoccupied Albert until the end of the war. A replica basilica was completed to the original design. Greater love hath no man than this that he lay down his life for his friend. In front of this monument on 1/7/16 the 'Tyneside Scottish' and the 'Tyneside Irish' brigades attacked the enemy. 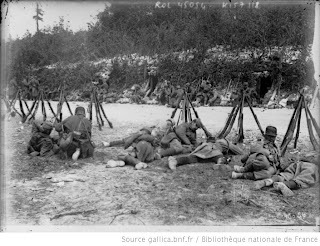 For many hours the fortunes of arms fluctuated but ere night had fallen the two Tyneside Brigades with the aid of other units of the 34th Division attained their objective. Think not that the struggle and the sacrifice were in vain. This cemetery is right outside Albert to the east along the D929 road. It began in July 1916 after the village of La Boiselle was taken. There are 28 graves of men from the Northumberland Fusiliers here, all but one of which bear the date July 1, 1916. Just over 150 men were buried here between then and the end of January 1917, when the cemetery was closed for wartime burials. The location of the cemetery is on the west side of Tara Hill, and another 250 or so graves were brought in after the Armistice, many being men of the 34th Tyneside Division who attacked further along the Bapaume road from here on the 1st of July 1916. It was the 101st and 102nd Brigade which attacked near here, and Lieutenant-Colonels Lyell and Sillery commanding battalions in the 102nd (Tyneside Scottish) Brigade died along with their men that day and like many of their men are buried here. In Plot 1, Row G, Grave 1 is Lieutenant Colonel William Lyle, age 40, commanding officer of the 23rd Battalion, Northumberland Fusiliers, one of the four battalions of the regiment called the ‘Tyneside Scottish’. These battalions were raised in the Tyneside industrial region of the north–east of England and associated themselves with a Scottish background. "He responded to Lord Kitchener's appeal August 1914 and died for his country." 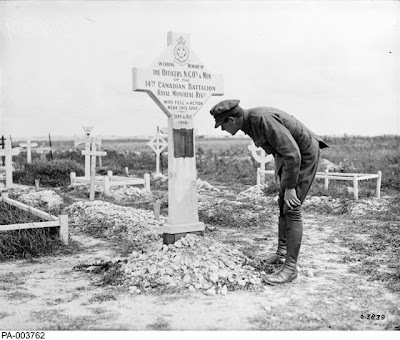 This photo right after the war shows a memorial to the Royal Montreal Regiment in the cemetery; according to http://www.ww1battlefields.co.uk/somme/albert.html the brass plaque the soldier is looking atnow hangs over the bar in the Royal Montreal Regimental Mess in Westmount, Quebec. South of Authuille towards Albert is Blighty Valley, a busy and often dangerous thoroughfare to the front lines facing the Leipzig Redoubt and Thiepval. 993 British soldiers lie here. 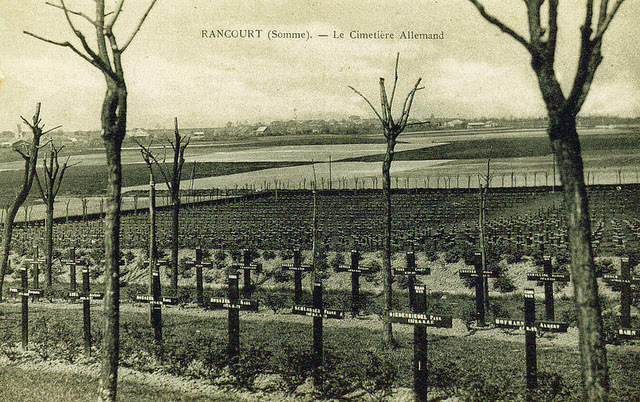 Today Rancourt has the dubious privilege of hosting three military cemeteries, one French, one British, and German. It is also the key site for the commemoration of French participation in the Battle of the Somme. There are only a few graves here from the early months of the war. Two thirds of the dead lying here are from the Battle of the Somme between July and November 1916. Most of the remainder are from the summer of 1918. 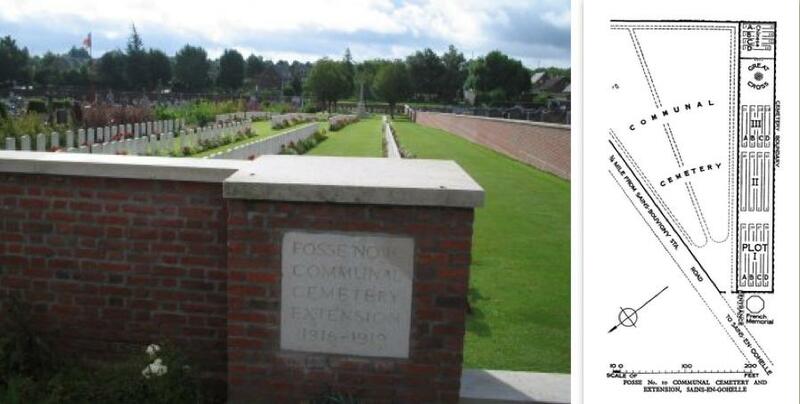 In 1929 repairs were carried out following negotiations with the French Government and the mass graves were given a proper wall and planted with roses. 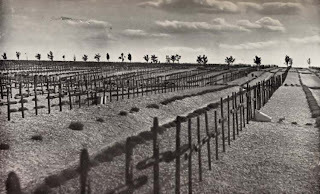 Trees were planted and the cemetery was inaugurated on 17 September 1933. 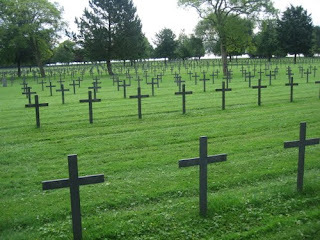 The problem of how to mark the names of the fallen had to wait until the end of the Second World War for a solution and eventually in 1972 the wooden crosses were replaced with crosses made from Belgian granite. There are two mass graves containing the remains of 7,492 soldiers of whom only 2,316 could be identified. A small chapel made from red Vosges sandstone lies within the cemetery and inside is an entombment carved by Geiger the Munich sculptor.